Christchurch kids have seen lots of diggers, dump trucks, and cranes lately with all the demolitions after our earthquakes so what better time for a book about a grumpy digger than now. Bruiser is a grumpy digger on a mission. He has to hurry up and plough the hillsides, crush rocks and tear up forests so that he can get the motorway built. But one day he gets stuck in the mud and no matter what he does he can’t get out. While he’s trying to get out, he knocks a magpie nest out of a tree and it’s up to Bruiser to get them to safety. 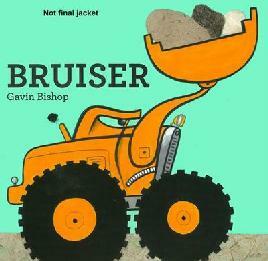 Bruiser has everything that a great picture book should. The story is full of mischief and fun, and it’s perfect for reading aloud. Gavin Bishop’s bright, bold illustrations bring his story to life and children (especially boys) will love this grumpy digger with a heart of gold. Gavin has effectively used the days of the week and numbers in his story, in a similar way to Eric Carle’s The Very Hungry Caterpillar, “On Monday he ploughed through five hills. On Tuesday he crushed ten rocks,” and so on. Children are always the best critics of picture books, and having read Bruiser aloud to a group of preschoolers, Bruiser gets the tick of approval. Bruiser is certain to become a New Zealand classic.